Uhh yeah, I am just as disappointed in myself as you are because you were probably hoping I would give you a full-on list on people that you need to please all the time. Unfortunately, I couldn’t think of more people worth your time, energy and money besides your own damn self. Let me tell you something, you need to start flexing on yourself as if you are trying to win yourself over. I need you to go all out for yourself hey – dedicate as much time as possible to hanging out with yourself, dedicate your energy to going on fun excursions all by yourself and dedicate most of your money on buying yourself every little silly thing you claim you need. Listen, as odd as it may be, the truth is that there are always people who are constantly trying to figure out where you are, who you are with and what you are doing but instead of taking that as an advantage to impress them, confuse them so much and don’t let them figure you out. Be on a journey to self-discovery. Introduce yourself to yourself, speak highly of yourself when you do – the goal is to impress. Figure out what you are into and what your definition of fun is. If ‘fun’ to you means something as simple as curling up and reading books then be so unnecessarily extra and buy yourself 20 books (if that’s not extra enough for you then wow wrap them up as a gift) – the ultimate goal is to impress. A guaranteed way to impress someone is by making them try something new. You know what you haven’t tried out yet so make it your priority to make it happen. Document your fun activities, share them and/or keep them in a folder. Focus on consistently impressing yourself, loving yourself, checking up on yourself – focus on you until the focus is on you. Go ahead and put your self-love game on steroids! I couldn’t have said it better! You hit the nail on the head with this post!🙌🏻 When I read your title of this post, I thought. “Hun, there isn’t anyone else to impress, but yourself. So what are you saying?” And then I read YOURSELF! That is what I had noticed too🙆, we tend to neglect ourselves and focus more on other’s happiness 💔. You are so right, we are also important hence we need to love ourselves more 🙌💖. Ok, this was beautifully written!!! Thank you!!!! Nice!! I couln’t agree more..
😂😂😂😂I trust you Mbalenhle thanks for this! Haha, look after #1 … trouble is, I never fall for my own flattery! Im back here. 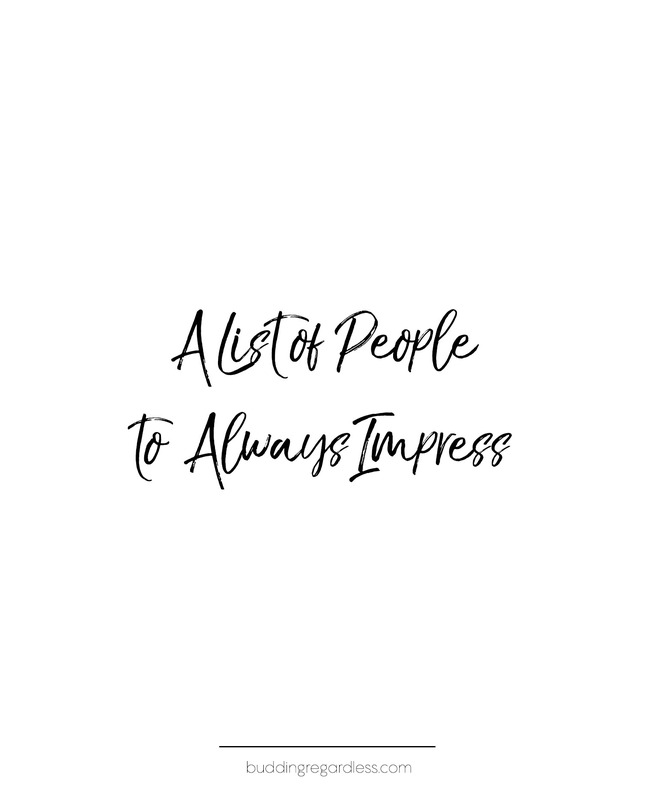 Mainly because I just wrote a post about being ‘wonderfully complex.” We try so hard to change ourselves to impress others that we forget who we are and what we stand for. This is amazing and just the point that everyone needs to understand. Oh, girl !! I can’t agree more. I learnt it hard way but it’s the ultimate weapon. Please visit my site I hope you will like and kindly follow me back. Greetings & Regards from India. Thank you so much for stopping by. I’m glad you agree too 🍃. It really meant a lot. It is so overwhelming that a writer like you liked my work. There are plenty of ways to pass time and plenty of things you could do while you are procrastinating, but here you are. Good to have you. Enter your email address to subscribe to this blog and receive notifications of new posts by email. Refresh your emails and confirm your subscription. ©2017-2019 Budding Regardless. Unauthorized use and duplication of this material without permission from the author is strictly prohibited. Links and pingbacks may be used so that full and clear credit is given to the author with direction to original content.